After 9/11 I read almost no fiction. What tragedies are there to read when one is living in the greatest Tragedy of one’s life? Likewise, with my home state voting against the Senate Majority Leadership, what comedy can match the Comedy of GOP control of government? I drifted to news sources such as The Economist, and later to wise strategists such as Thomas Barnett and Mark Safranski. My difficulty with fiction continued even after I wished to, because I could not focus on fictional plots and fictional stories. Thus I am grateful to mystery writer Dean Barrett for bringing back normalcy to my reading habits. Along with C.S. Lewis, Barrett as made me enjoy fiction again by painting exotic worlds with real problems. If Ayn Rand’s writings are Romantic Realism — people as they should be in the world as it is — Barrett and Lewis write Realistic Romance — people as they are in the world as it should be. With that teaser behind us, continue on for my review of Dean Barrett’s Murder in China Red (A Chinaman Mystery). I was suspicious almost immediately after purchasing Murder in China Red. Unlike the other Barrett novels I read and enjoyed it does not take place in the exotic Orient but the mundane East — specifically, New York. The “China Red” in the title refers to the color vermilion, and the “Chinaman” in the series is the professional name of a private detective who immigrated from Beijing during the Cultural Revolution. Yet Dean Barrett pulled through. The author has done with once before, with his Vietnam-era tale Memoirs of a Bangkok Warrior. In that tale there was no mystery, only a happy tale of army hijinx that because more sad, and romantic, as the pages turn. Memoirs of a Bangkok Warrior established Barrett as an author who can go outside his genre, and succeed at the difficult task of evoking the atmosphere of a foreign land and time. Murder in China Red is the complement to Memoirs of a Bangkok Warrior. All the cliches of a detective novel are on full display: the grizzled investigator, the dysfunctional ex-family, the feud with the police, the crummy office, secret agents, even the love to be avenged. Yet the author accomplishes this without his usual evocative atmosphere, instead focusing on building an excellent detective story. Throughout the book, Barrett also succeeds at the difficult task of building a coherent myth-cycle. The hero of Murder in China Red is a step-brother of the hero in Skytrain to Murder, though they do not meet in either setting. Literary shadows are used to good effect, as characters known to both are tantalizingly outlined. Murder in China Red is an excellent collection to anyone’s fiction library. Dean Barrett is an excellent author, adept at whatever he tries. From painting a landscape, to boiling a detective, to offering exciting and adventure, Barrett’s pen is mightier than even an femme fatale’s Smith & Wesson 4506. 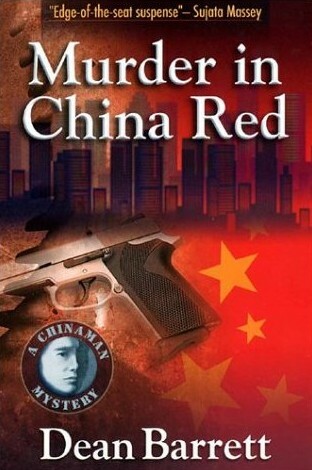 Murder in China Red, a Chinaman Mystery, by Dean Barrett, is 260 pages. It retails for $11.95 at Amazon.com or $10.75 at Barnes & Noble. Both Skytrain to Murder and Memoirs of a Bangkok Warrior have been previously mentioned on tdaxp.